The place that captivated Us and set our dreams into motion is located in the foothills of the Grazalema range, close to the historic village of Arcos de la Frontera (Cádiz). For many centuries, Arcos was a strategic town coveted for its privileged location. Its name originates from Roman times when it was founded as Arx-Arcis (the high fortress). The Tesalia Estate stands on 106 hectares against the backdrop of the iconic town of Arcos de la Frontera and the Grazalema mountains. Of the 22 hectares dedicated to the winery, 11 hectares are under vine, a further 30 hectares are dedicated to the horse breeding and competition area, and the rest is farmland. The vineyards are planted on the slightly ondulating, north-facing sloope. The land is classic Andalusian terrain: clay soils lying above a subsoil of chalk. 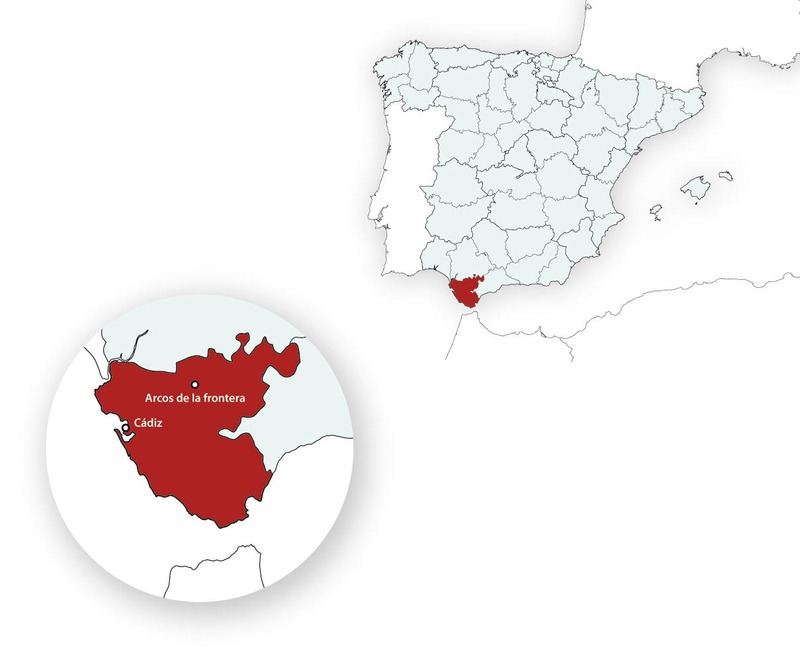 Scarcely fertile country, but ideal for Petit Verdot and Tintilla de Rota, and other varieties such as Syrah and Cabernet Sauvignon. The climate at the Tesalia Estate is warm and sunny, tempered by the influences of the Grazalema mountain range, the Mediterranean and Atlantic oceans, the water mass from huge local reservoirs. Here, craftsmanship in the vineyard balances aeration and shade on gentle north facing slopes helped by cool air of the mountain and the sea breezes. With an average annual temperature of 17.3ºc, between 600 and 700 mm of rain falls predominantly in winter. These characteristics create ripening conditions ideal for varieties such as Petit Verdot and the indigenous Tintilla de Rota. Controlled irrigation is used when necessary to alleviate stressed vines and maximise the quality of our grapes. Leaf pulling and cluster thinning are important steps in aiding the ripening of the grapes. All grapes are hand-harvested at night and all 10 vineyard blocks vinified separately, then blended for added complexity. There is no set formula – the blends depend on the vintage. Even sections within a vineyard are monitored according to the acid/pH levels, natural sugar levels and flavour of the grapes, which are often picked over a two-week period to optimise ripeness and quality. Un profunda investigación del suelo condujo al uso de portainjertos y clones de variedades, tanto autóctonas como internacionales, como la Petit Verdot y Tintilla de Rota. Otras variedades plantadas son la Syrah y Cabernet Sauvignon. Extensive soil research led to the use of particular rootstocks and clones of both indigenous and international varieties, such as Petit Verdot and Tintilla de Rota. Other varieties planted are Syrah and Cabernet Sauvignon. Clusters are carefully selected in the vineyard, and upon arrival at the winery the grapes are displayed on tables for further selection. Controlled fermentation and extended aging in mainly new French barrels contribute to complexity and balance. Each variety reaches the wooden or stainless steel fermentation deposits by gravity. After pressing, selected french oak barrels are used to ensure optimum development and blending. Time spent barrels is decided on an individual basis by taste testing. The wine is then clarifyed and bottled.